Tulster makes really nice all kydex IWB holsters and mag carriers. 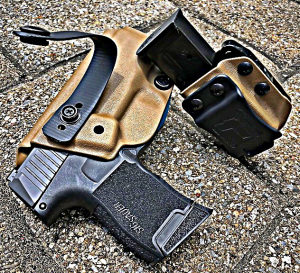 Here we are again with another Inside the Waistband (IWB), all-Kydex holster review. This time it is a holster from the well-known company, Tulster. In addition to the holster, I'm reviewing their new Echo Mag carrier as well. 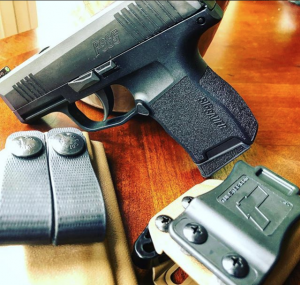 There isn't a tremendous amount of difference from a Kydex holster made by one company compared to another. But the little differences matter and Tulster's attention to these details make their holsters better than most. One thing you will notice about their Holsters is that they are not sloppily put together. The holsters are formed well, edges are finished and not sharp and the hardware is not cheap garbage. 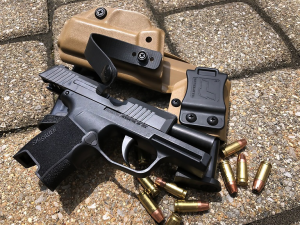 And when it comes to all Kydex holsters, they got it right when it comes to eliminating any excess material around the trigger guard that blocks you from establishing a proper grip while the gun is still in the holster. This also keeps the holster from being bulky or having unnecessary angles that make it uncomfortable to wear. Pairing this Tulster holster with a P365, awesomeness. As someone who likes to use soft loops on my holster, I appreciate that Tulster lets you choose this option. I guess some companies are biased against us ‘loopies' but it is something that makes their holsters appeal to a wider group of customers. You can order a holster for most of the major gun manufacturers and in many cool colors and patterns. So I was familiar with Tulster's holsters, but their new Echo Mag Carrier is something that wasn't on my radar. I know not everyone carries extra magazines, but for those of you who do, this may interest you. 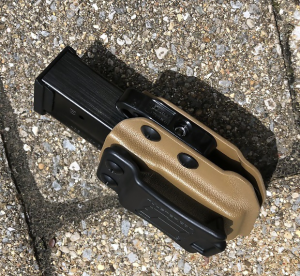 So of course, Kydex mag carriers are nothing new, but Tulster makes their carriers with an adjustable cam device that allows you to use the same mag carrier for different sized magazines. This is great if you carry different guns and don't want to buy a different mag carrier for each gun. The Echo mag carrier has an adjustable cam that allows it to accommodate magazines from different manufacturers. There are 4 models of mag carrier. One for single stack 9mm-.40 and one for double stack mags of 9mm-.40. The same goes for single and double stack .45 magazines. Now I am not sure how, but I was able to use my single stack 9mm-.40 Echo Mag carrier for a G27 mag, a P365 mag and a G43 mag without any problem. I mention this because the G43 is single stack and the G27 is a double stack, and the P365 well is kinda a hybrid of the two. So while not exactly as intended, the magazines may be a little more universal than expected. I like this holster/mag carrier combo and it is what I have been carrying my P365 in. Nothing too fancy but just a solid, quality made Kydex holster with a versatile mag carrier. I think it would be great if they were able to make a double mag carrier that incorporates the tension device. You can choose soft loops or a hard clip for your holster. On their webpage, you will find holsters, mag carriers, and other everyday carry (EDC) gear and gun accessories. Tulster holsters ship super fast, and at around 60 bucks for the holster and 35 for the mag carrier you can be in business for the same price as other companies at a comparable price. Thank you for the review Matthew. As you might recall I was having holster issues at the training in Byers so this may be an option. No. The P365 magazine can be jammed into the single stack magazine carrier, but will not insert completely and will sit about an inch too high. Thanks Devil Dog, you have me sold on a Tulster holster for my Sig P365. Great to hear Scott. Quality holster with the P365 is a great combo.